KENT, Washington (August 5, 2018) – With three out of the four nitro final-round entries coming out of the Don Schumacher Racing stable, team owner Don Schumacher was able to ‘double-up’ at the CatSpot NHRA Northwest Nationals, the final event of the Western Swing. 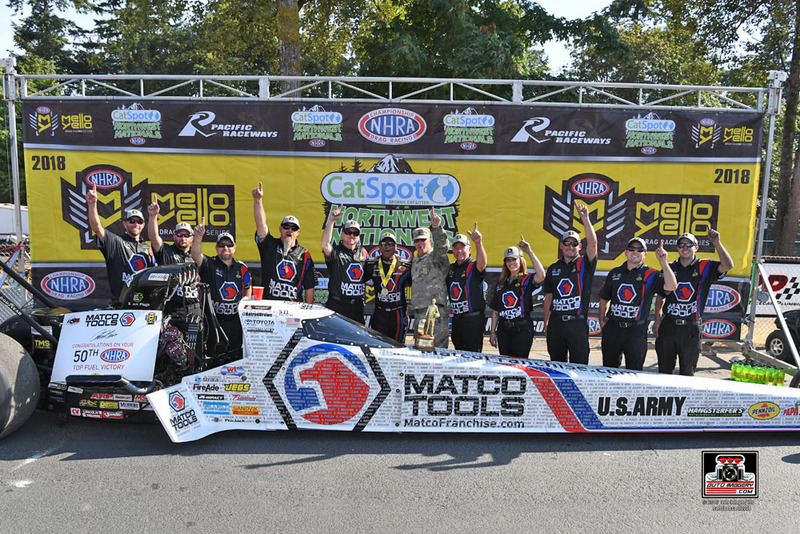 Antron Brown (Top Fuel) and Ron Capps (Funny Car) raced to the winner’s circle on Sunday afternoon, bringing DSR’s win total to an unprecedented 328 victories. It was Brown’s 50thTop Fuel Wally trophy, and Capps’ 60th professional Wally. Brown opened the day with a win over Shawn Reed to set up a second-round matchup against teammate Tony Schumacher. Both cars smoked the tires early, but Brown recovered quickly to win the pedalfest. In the semifinals, he would face Steve Torrence in an epic matchup. Brown had a 0.020-second advantage at the light, then held off Torrence to win on a holeshot by 0.009 seconds. 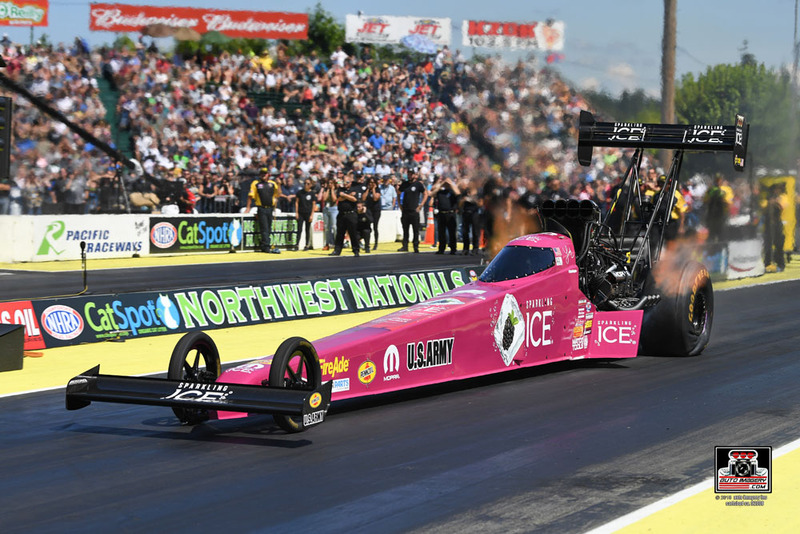 In the finals against teammate Leah Pritchett, Brown took the immediate lead and never trailed for his third consecutive Seattle victory. The final margin of victory was 0.0047 seconds (approximately two feet) and enabled Brown to capture the elusive 50th Top Fuel victory he has sought since Brainerd 2017. 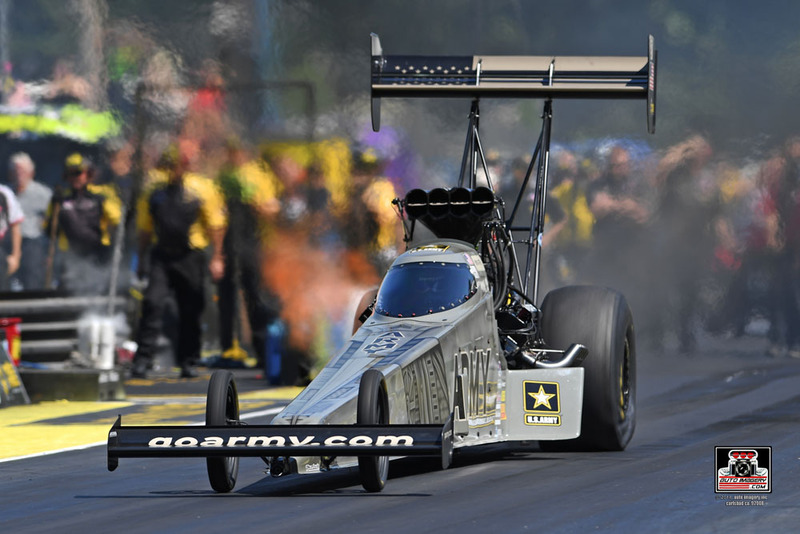 “It's no secret that we struggled at the beginning of the year,” said Brown, who joined Schumacher, Larry Dixon and Joe Amato as the only NHRA drivers to win 50 Top Fuel events. “We lost (crew chief) Brian Corradi, and then we had a lot of our team moving around, so they've had to gel in new spots and positions. Our main focus has just been to get better every race and learn this new combination and how to make it work. 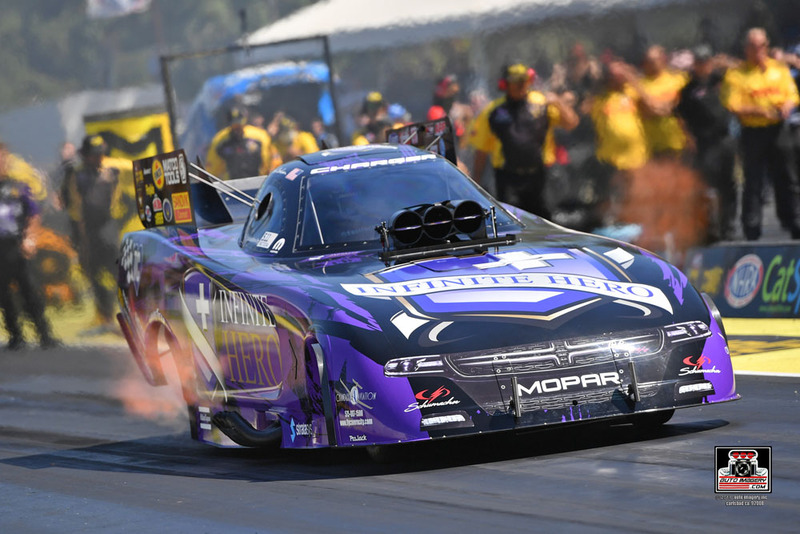 In Funny Car, Capps’ milestone 60th win came on the heels of two consecutive final round appearances for the driver of the Pennzoil Synthetics/NAPA AUTO PARTS Dodge Charger R/T Funny Car. Along his way to the winner’s circle, the four-time Pacific Raceways event champion defeated Jonnie Lindberg, teammate Matt Hagan and powered to an impressive pass on a bye run during the semifinals to earn lane choice in the final round. The final, Capps’ 117th, was a battle of the NHRA Countdown to the Championship points leaders with No. 2-ranked Capps facing No. 1-ranked Courtney Force. It was a nail-biter of a race against Force with both drivers nearly even leaving the starting line. Capps and Force kept pace with each other until just before the finish line when the Pennzoil Synthetics/NAPA AUTO PARTS Dodge surged ahead for the win. Although Capps wasn’t able to close in on Force’s point lead by much, he was able to prevent her from widening the gap. In defeating Force, Capps and the Pennzoil Synthetics/NAPA AUTO PARTS team was able to prevent John Force Racing from ‘sweeping’ the Western Swing by earning all three of the swing’s Funny Car Wally trophies. 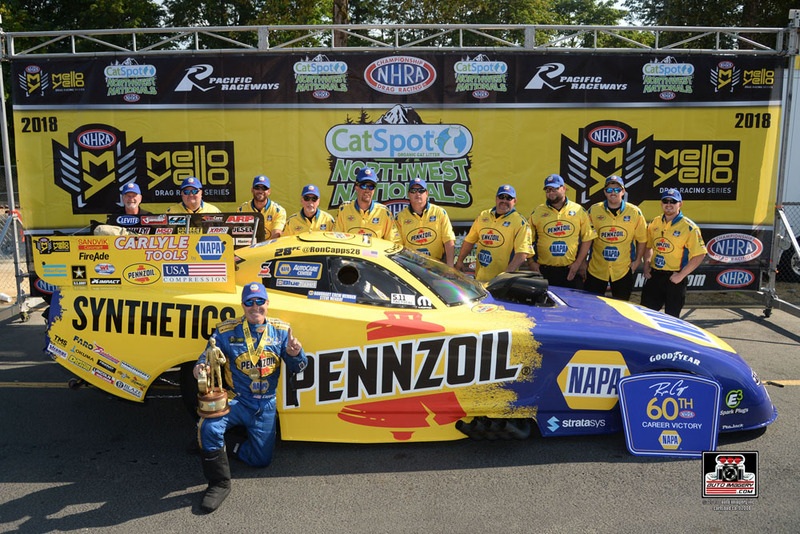 It was a quintessential Rahn Tobler/Ron Capps performance that allowed the duo to pick up their 24th win together on Sunday afternoon. It was at Pacific Raceways in 1995 where Capps claimed his first professional win, his only Top Fuel victory. Capps was nostalgic as he recalled a day he considers a crucial turning point in his career. Pritchett qualified the Sparkling Ice dragster sixth and raced to the final round, starting with a gutty first-round win over Troy Buff. She scored a holeshot victory with her lap of 3.809-seconds at 325.53-mph besting Buff’s pass of 3.798-seconds at 315.71-mph. Pritchett used another consistent run of 3.823-seconds to defeat Clay Millican in round two for the second time on the swing to advance to the semifinals. Upset-minded Mike Salinas was the next competitor trying to stop Pritchett and her black raspberry-hued machine. Salinas had the initial jump, but Pritchett drove around him to claim the win with a pass of 3.838 seconds at 304.74 mph. The victory secured a second final round appearance during the Western Swing, and Pritchett's first at Pacific Raceways. After making four solid runs during qualifying, last week’s runner-up started from the No. 4 position and faced Terry McMillen in the opening round. Schumacher had the quicker reaction time, and despite hazing the tires, never trailed for the win against McMillen who was up in smoke early into the run. In the quarterfinals, Schumacher drew teammate Antron Brown. Both drivers smoked the tires at around the same time, and both veteran pilots were on and off the throttle. Brown was able to get his rail to hook up enough to take the win, ending Schumacher’s day at the quarterfinals. The 2007 Pacific Raceways Funny Car champion faced Shawn Langdon in round-one of eliminations. Beckman was 2-0 versus Langdon in prior events but was unable to extend his lead on Sunday morning. The two world champions were nearly even after launching from the line with the Infinite Hero Dodge keeping pace until the 660-foot mark when Langdon was able to pull ahead for the round win. With his first Pacific Raceways No. 1 qualifier, Matt Hagan earned the advantage of lane choice to start Sunday versus his first-round opponent, Cruz Pedregon. 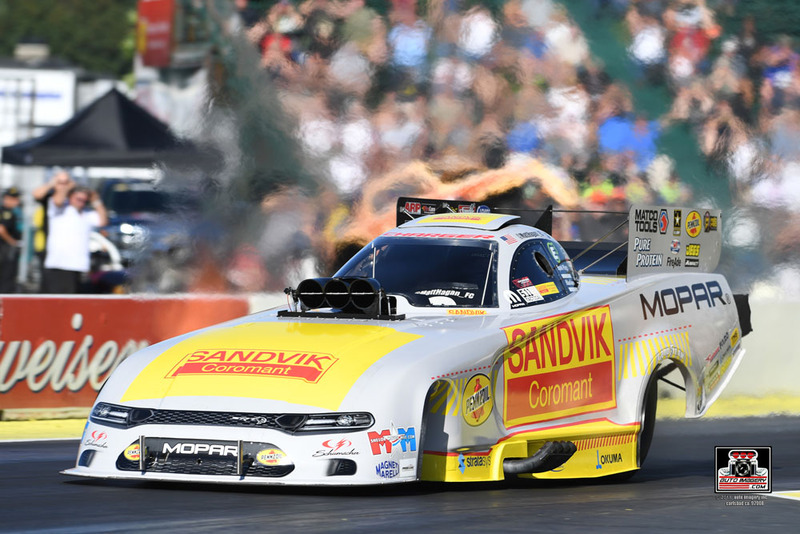 In his Sandvik Coromant Dodge Charger SRT Hellcat, Hagan eclipsed Pedregon at the 60-foot block and charged down the track for the decisive win. In round two, the 2013 event champ faced teammate Ron Capps. It was a very close race between the two Pennzoil-powered Dodges, but Capps was able to set off the win light, ending Hagan’s chances at picking up his fourth victory of the season. It was an all-John Force Racing day for Tommy Johnson Jr., who picked off John Force and Robert Hight, before succumbing to Courtney Force in the semifinals. Johnson was quick on the throttle and had the starting line advantage against the elder Force. 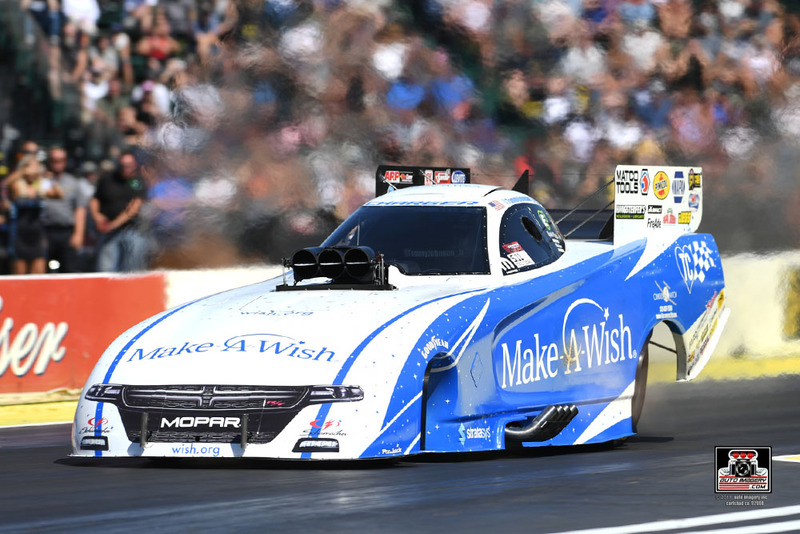 Both drivers had issues – Force lost traction and Johnson had a hole out, but Johnson charged on in the Make-A-Wish Dodge and crossed the stripe first. In the quarterfinals, Johnson defeated the reigning world champion with a 4.074 versus Hight’s 4.551. Johnson, who has wins in both Top Fuel (career first) and Funny Car at Pacific Raceways, had the better reaction time versus C. Force, but Force was able to pull ahead before the 330-foot mark and drive away with the win, ending Johnson’s chances for a second consecutive Northwest Nationals final round appearance.